Over the years the times have been many that I have pondered the visitation of Our Lady to her cousin. It has always been a blessing to recall the joy inherent in the Elizabeth's greeting, that the hidden infant in her womb leaped for joy. I have always considered that the reason for the joy in the narrative is the presence of the long-awaited messiah who had finally come into the world. In Mary's womb rested the hope of all generations, the salvation of the world. While today's feast is undoubtedly Christological in its significance, we also take the opportunity to consider and honor Mary in it. 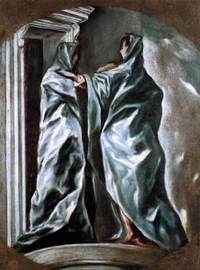 Upon deeper consideration the Visitation also provides us with great pneumatological insight for living the life in Christ. The lectionary readings for today, especially the second option for the first reading, give us a model to follow if we truly desire to imitate the way of life that Mary shows us. That is, if we truly believe and are devoted to her as the Ark that holds the New Covenant, then we see that her fullness of grace is also a fullness in modeling spiritual holiness by way of submission and obedience to the gentle spirit of peace. In a mysterious way everything we desire to know and achieve can come together in one simple prayer, if it is a prayer that has come to be a part of our hope founded on Christ and associated with the desire to serve God in the beauty of holiness. I don't ask why so much as I simply understand that whenever I say "Our Father..." or "Hail Mary..." there is much more going into it than merely the words that I am saying. It is my heart that prays and the culmination of all I believe, even the deepest cries of my soul, are summed up when I give to God my all and say a simple prayer. Sure enough, what today's feast shows us has a lot to do with joy, and it has a lot to do with the great mystery of salvation coming to the world. However, in a way that touches our lives in the here and now, the Visitation shows us the spiritual path of humility and service. In ways that we may not have yet considered it shows us the path of peace and justice through total submission to the Spirit that is peace and justice. As the three o'clock hour arrives in my time, I take this moment to reflect upon God's great mercy and my gratitude for it. I had planned on getting into the blog somewhat earlier, but I had a busy day planned in light of my summer job search. It actually turned out fruitful in that I received a call only an hour ago offering me a position that I hoped for--one in which I will continue to serve as a teacher for individuals with cognitive disabilities--closer to my home and also allowing me to gain experience working with high school students. I looked earlier at the readings for today and I was impressed with Sirach's discourse on mercy. Sirach speaks to God, "Give new signs and new wonders...give us evidence." His is a prayer of faith, and certainly when we want--when we have needs--we must speak to God out of our faith. We learn to say "Lord, here are my needs; you know them well, and now I wait. I trust in you to show your great mercy." Time and again in my life I've seen that God is looking out for me. It doesn't mean that there aren't tough times, and, as always, we are expected to hold up our end in things. God makes us his partners in salvation. That's why it's okay to say "show me your wonders Lord. Give me evidence." God wants humanity to cooperate. I rejoice that Catholic doctrine teaches me that I am an active partner in the work of salvation rather than a passive recipient only. Still, I thank God for what I have received...for what I have been given in grace. It's all about mercy--receiving mercy and giving mercy. Thanks be to God for all good things! I'll return later with more...the summer has just begun. (National Catholic Register) Catholics should celebrate when anyone enters the Church. After all, we have it on good authority that the angels in heaven do. But when a prominent Protestant converts, we might not just feel like celebrating; we might feel like doing a victory dance in the end zone. But the second lesson is this: Despite the tragic decision of Christian denominations to split from the Church, there is still much good in Protestant Christianity, and the biggest conversions come when we treat Protestant believers with respect. Today's gospel recounts the giving of the commandment that we love one another. It is the commandment on which we base our lives because it encapsulates the message of the Good News: in Jesus Christ God has given us a great gift, one that transforms both heaven and earth, reaching to the deepest foundations of human experience; reaching into every life and leaving no place, no heart, untouched. The commandment to love one another is a simple and easy message, yet it also calls to us from the depths of experience. It is the message of reciprocity between us and God. As we have received, so we are to give in return. Thus the commandment to love one another contains a twofold movement. It has to do both with God's love for us, and with our responsibility to love others. We recall that God sent Christ to die for us while we were still sinners. The transforming power of God in our lives is a witness to the great love we have received. The message of God's reprieve to humanity brings to mind the most evangelical qualities of our faith; that is, it embodies the gospel message that is personal to us in our salvation, in our relationship to Christ and one another. It is the message that God comes into our lives and makes us new. It is the message of the grace of God: of receiving undeserved favor in being saved from sin to eternal life. Recently, I reflected on the idea that in order to receive the goodness of God that we must present ourselves to God as we are. At any stage in our lives we must be able to love the person that God made. Without pretense or flight to fantasy we fully accept ourselves, who we are and as we are, not more or less, as the handiwork of God—we are God's ongoing creation, revealing the transforming power of love. A friend of mine commented, "I think we also have to be willing to help others while knowing that we are far from perfection... We are called to share what we have been given and what He has allowed us to know, even if we may still be struggling with certain issues, or far away from any level of heroic virtue in our own lives." Indeed such is the beginning of carrying out the commandment to love. First, before we can love others, we must love who we are, we must accept the person God made in ourselves. To fulfill the commandment to love one another we must first receive the love of God in our lives and then share it with the whole world. To love one another is not an option. It cannot be given only to those whom we like; we are to offer it to everyone. To do so is the foundation of Christian ethics. Loving others is our primary responsibility: the true litmus test—the shibboleth—of our personal faith. More than simply being an attitude that we convince ourselves we possess, we must ascertain that the love we hold claim to is real in action. We must offer it in though kindness, mercy, compassion, and acceptance of all others. Our daily actions toward others deeply reveal the love of God active in our lives. It is evident in the quality of friendship—or even the mere friendliness—that we offer each stranger, each passerby, each family member, and each and every coworker or acquaintance. Daily we have multiple opportunities to fulfill the personal and immediate dimension of obeying the commandment to love one another. There is also the universal dimension. It is no less real, and no more ideal, than the love we are to offer in our daily encounters. The universal of the commandment is evident in our willingness, our capacity, to give to the whole world from the good that we have been given. The degree to which we are willing to take a stand as peacemakers and healers literally shows the love of God active in our souls. Love approaches her enemies with an olive branch in hand and looks to the future with hope for coming generations. Like a mother protecting her young, love considers the needs of her children first. In following the global commandment to love we must have an eye toward the future that is full of hope. We must seek to build a world that is hospitable to all: a world free of war, where peace is won by giving rather than by the proliferation of might. Love looks to a world where we are willing to share our good things with others. Love is to share peace, to share the wealth of our nations, to share food and medicine, to share our lands with strangers and, and to protect and preserve the planet for future generations. To love one another is to give without counting the cost or reckoning who we give it to. It is to hold and to bind, to forbear and to forgive. Love is to give completely of ourselves knowing that all things are but God's good gifts to us first. When we accept the responsibility—the commandment—to love, we will be known as the disciples of our Lord. Then our eyes might catch the vision of a world and a future full of hope, one where all things are made new.